VietNamNet Bridge - The first banknote in the history of Vietnam's currency is the one called "Thong bao hoi sao" which was issued in 1396 by Ho Qui Ly. More than six centuries later, banknotes increasingly confirm its important position in life. In the feudal time, each dynasty often cast its own money and even banknotes, including bronze, zinc, iron coins and some kinds of banknotes like "Thai binh thong bao" of the Dinh Dynasty and "Thien phuc tran bao" of the Early Le Dynasty. However, the first and most well-known banknote of Vietnam is "Thong bao hoi sao" of the Ho Dynasty. 1396 was a very early time in the history of banknotes but at that time, Ho Quy Ly’s policy to issue banknotes was not considered progressive. After printing banknotes, the Ho Dynasty forced people to exchange coins for banknotes, with one quan of coin for two banknotes. The people were banned from using coins, otherwise they would be executed and their assets would be confiscated. This kind of banknote was put into circulation in a radical way. The way of issuance was completely exchanging the old money to the new money so theoretically it would not affect the value of the money and it was even a progressive thinking to save metal and to make the use of money in a more convenient way. However, to take the banknotes into the real life it requires suitable economic and social reforms. In the conditions of the Ho Dynasty, the banknote policy failed. In the time of French rule in Indochina, the monetary unit in the region was Piastre, often referred to as "bac". Initially the Mexico coins were used, weighing 27.73 grams and then the Dong Duong (Indochina) coin weighing 27 grams. The Indochina Bank also issued banknotes, which were printed with three girls in the traditional costumes of the three Indochinese countries. From December 1, 1945, when the state of the Democratic Republic of Vietnam issued the first currency (aluminum coins), Vietnam has had so many kinds of coins, paper and polymer banknotes. Along with the issuance of money were many times of money changes, since 1945. The first change of money took place on May 15, 1947 when the Government issued Decreed 48/SL for circulation in the country the banknotes with face values of 1 dong, 5 dong, 10 dong, 20 dong, 50 dong, 100 dong and 500 dong. 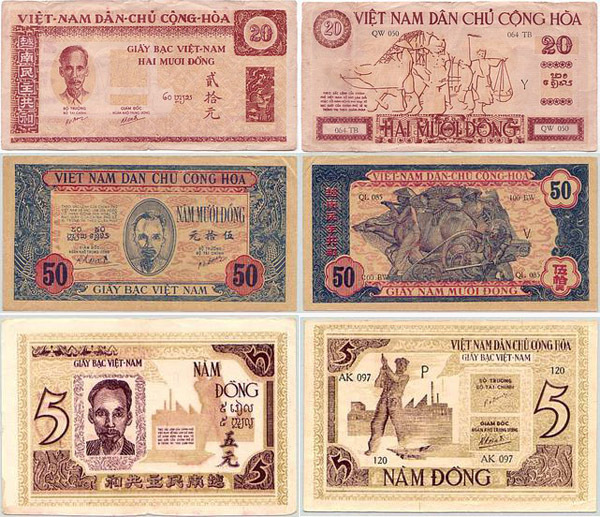 The State simultaneously exchanged the Dong Duong banknote into Viet Nam dong banknote, at the rate of 1 Viet Nam dong for 1 Dong Duong banknote. On May 6, 1951, Ordinance 15/SL signed by President Ho Chi Minh was issued to approve the establishment of the National Bank of Vietnam. On May 12, the bank officially released banknotes named "National Bank of Vietnam" to replace the money issued of the Ministry of Finance in 1947. The exchange rate was 10 dong of the old banknotes for 1 dong of the new one. This money exchange took place for up to 20 months, the longest in the history of Vietnam’s money exchange. The third time of money exchange took place in February 1959, with the exchange rate of 1 dong of the new money for 1000 dong of the old one. With this new value, from February 1959 to October 1960, 1 dong was equivalent to 1.36 Russian ruble or US$1.2. The 1959 money exchange is considered the most "spectacular" in the history of Vietnam's currency. In October 1961 the currency of the National Bank of Vietnam in the northern region was renamed into the money of the State Bank of Vietnam with the same face values, to not have the same name with the money of the National Bank of Vietnam in the southern region. On May 3,1975, the revolutionary government took over the National Bank of Vietnam of the former Saigon regime and still used the old currency in the first day of unification. On June 6, 1975, the Provisional Revolutionary Government of the Republic of South Vietnam enacted Decree No. 04/PCT - 75 on the establishment of the National Bank of Vietnam, led by Governor Tran Duong. On September 22, 1975, the Provisional Revolutionary Government of the Republic of South Vietnam organized an exchange to put into circulation the new currency named "Bank of Vietnam Money" (also known as liberation money) at the rate of 1 dong of the new currency for 500 dong of the old one and equivalent to US$1. The fifth exchanged took place on May 2, 1978, when the Socialist Republic of Vietnam State announced the 3rd exchange on a national scale to unify the national currency at the rate of 1 dong of the old currency in the North or 0.8 dong in the South for 1 dong of the new currency. And most recently, on 14.09.1985 the State had to exchange the currency, at the rate of 10 dong of the old currency for 1 dong of the new one.